^ Bancroft, Hubert Howe (1888). History of California, Volume 23: 1848-1859. San Francisco: The History Company. pp. 32-34. http://www.1st-hand-history.org/Hhb/23/album1.html. ^ Bancroft, Hubert Howe (1888), pp. 39-41. ^ Holliday, J. S. (1999). 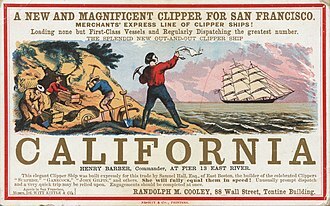 Rush for riches; gold fever and the making of California. Oakland, California, Berkeley and Los Angeles: Oakland Museum of California and University of California Press. pp. 60. ^ Bancroft, Hubert Howe (1888), pp. 55-56. ^ Starr, Kevin (2005). California: a history. New York: The Modern Library. pp. 80. ^ Bancroft, Hubert Howe (1888), pp. 103-105. ^ Bancroft, Hubert Howe (1888), pp. 59-60. ^ Rawls, James J. and Orsi, Richard J. (eds.) (1999). A golden state: mining and economic development in Gold Rush California (California History Sesquicentennial Series, 2). Berkeley and Los Angeles: University of California Press. p. 187. ^ Brands, H.W. (2003). 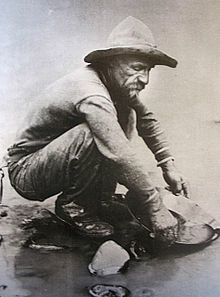 The age of gold: the California Gold Rush and the new American dream. New York: Anchor (reprint ed.). pp. 103-121. ^ Brands, H.W. (2003), pp. 75-85. 他にもニカラグアを抜ける経路が1851年に開発されたが、パナマ経路ほど人気は無かった。 Rawls, James J. and Orsi, Richard (eds.) (1999), pp. 252-253. ^ U.S. National Park Service, Found! The Wreck of the Frolic (accessed Oct. 16, 2006). ^ Bancroft, Hubert Howe (1888), pp. 363-366. ^ Dillon, Richard (1975). Siskiyou Trail. New York: McGraw Hill. pp. 361-362. ^ Wells, Harry L. (1881). History of Siskiyou County, California. Oakland, California: D.J. Stewart & Co.. pp. 60-64. ^ Brands, H.W. (2003), pp. 43-46. ^ Starr, Kevin and Orsi, Richard J. (eds.) (2000). Rooted in barbarous soil: people, culture, and community in Gold Rush California. Berkeley and Los Angeles: Univ. of California Press. pp. 50-54. ^ Brands, H.W. (2003), pp. 48-53. ^ a b c Starr, Kevin and Orsi, Richard J. (eds.) (2000), pp. 50-54. ^ Brands, H.W. (2003), pp. 197-202. ^ a b c Starr, Kevin and Orsi, Richard J. (eds.) (2000), pp. 57-61. ^ Brands, H.W. (2003), pp. 53-61. ^ a b Starr, Kevin and Orsi, Richard J. (eds.) (2000), pp. 53-56. ^ Brands, H.W. (2003), pp. 61-64. ^ Brands, H.W. (2003), pp. 93-103. ^ Starr, Kevin and Orsi, Richard J. (eds.) (2000), pp. 57-61. 別の推計では70,000人から90,000人が1849年に到着したとしている (ibid. p. 57). ^ Brands, H.W. (2003), pp. 193-194. ^ Freguli, Carolyn. (eds.) (2008), pp.8-9. ^ 別の推計では2,500人のフォーティナイナーズがアフリカ人の子孫だった。 Rawls, James, J. and Orsi, Richard (eds.) (1999), p. 5. ^ Starr, Kevin and Orsi, Richard J. (eds.) (2000), pp. 67-69. ^ Holliday, J. S. (1999), pp. 115-123. ^ a b Rawls, James J. and Orsi, Richard (eds.) (1999), pp. 123-125. ^ Paul, Rodman W. (1947) California Gold, Lincoln: Univ. Nebraska Press, p.211-213. ^ a b c Clay, Karen and Wright, Gavin. (2005), pp. 155-183. ^ Lindley, Curtis H. (1914) A Treatise on the American Law Relating to Mines and Mineral Lands, San Francisco: Bancroft-Whitney, p.89-92. ^ Brands, H.W. (2003), pp. 198-200. ^ Bancroft, Hubert Howe (1888), pp. 87-88. 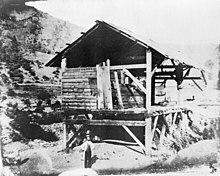 ^ a b c d Mining History and Geology of the Mother Lode (accessed Oct. 16, 2006). ^ a b Rawls, James J. and Orsi, Richard (eds.) (1999), pp. 32-36. ^ a b Rawls, James J. and Orsi, Richard (eds.) (1999), pp. 116-121. ^ Rawls, James J. and Orsi, Richard (eds.) (1999), pp. 36-39. ^ Rawls, James J. and Orsi, Richard (eds.) (1999), pp. 39-43. ^ a b Holliday, J. S. (1999) pp. 69-70. ^ Holliday, J. S. (1999), p. 78. ^ ある推計ではカリフォルニアでの金探求で財政的に利益を上げた探鉱者は20人に1人もいなかった。Rawls, James J. and Orsi, Richard (eds.) (1999), p. 7. ^ Johnson, Susan Lee. Roaring Camp: The social world of the California Gold Rush. New York: W.W. Norton (2000), pp. 164-168. ^ Rawls, James J. and Orsi, Richard (eds.) (1999), pp. 52-68. ^ Rawls, James J. and Orsi, Richard (eds.) (1999), pp. 193-197. ^ Rawls, James J. and Orsi, Richard (eds.) (1999), pp. 212-214. ^ Rawls, James J. and Orsi, Richard (eds.) (1999), pp. 256-259. ^ Rawls, James J. and Orsi, Richard (eds.) (1999), pp. 193-197; 214-215. ^ Rawls, James J. and Orsi, Richard (eds.) (1999), pp. 226-227. ^ Starr, Kevin and Orsi, Richard J. (eds.) (2000), p. 50. 別の推計では、1848年1月以前のカリフォルニアに7,000人から13.000人の非先住民がいたことになっている。 See Holliday, J. S. (1999), pp. 26, 51. ^ 歴史家達はゴールドラッシュとそれがカリフォルニアに与えた影響を熟考してきた。歴史家のヒューバート・ハウ・バンクロフトはゴールドラッシュがカリフォルニアを「急速で怪物のような成熟度」に進めたという言葉を使い、歴史家のケビン・スターはその問題と恩恵全てについて、ゴールドラッシュは「アメリカ人カリフォルニアの設立パターン、DNAコード」を確立したと述べた。See Starr, Kevin (2005), p. 80. ^ Heizer, Robert F. (1974). The destruction of California Indians. Lincoln and London: Univ. of Nebraska Press. pp. 243. ^ Starr, Kevin and Orsi, Richard J. (eds.) (2000), pp. 56-79. ^ a b Starr, Kevin (2005), pp. 91-93. ^ Rawls, James J. and Orsi, Richard (eds.) (1999), pp. 243-248. 1860年までに、カリフォルニアには200以上の製粉所ができ、小麦と小麦粉を世界中に輸出していた。Ibid. at 278-280. ^ Starr, Kevin (2005), pp. 110-111. ^ Starr, Kevin (1973). Americans and the California dream: 1850-1915. New York and Oxford: Oxford University Press. pp. 69-75. ^ Hill, Mary (1999), pp. 192-196. ^ Rawls, James J. and Orsi, Richard (eds.) (1999), pp. 278-279. ^ 歴史家のジェイムズ・ロールズとウォルトン・ビーンは、金の発見が無ければ、オレゴン州がカリフォルニアに先立って州に昇格しており、最初の「大陸横断鉄道はオレゴン州に行っていただろう」と主張してきた。See Rawls, James, J., and Walton Bean (2003), p. 112. ^ Rawls, James J. and Orsi, Richard (eds.) (1999), pp. 285-286. ^ Rawls, James J. and Orsi, Richard (eds.) (1999), pp. 287-289. ^ Brands, H.W. (2003), p. 442. ^ ゴールドラッシュ後の農業が支配的な開発過程では、1869年までに鉱業よりも多くの者を雇用できるようになった。...1879年にはカリフォルニア経済を引っ張って行く要素として鉱業の生産高を超えた。Starr, Kevin (2005), p. 110. ^ Hill, Mary (1999), pp. 168-169. ^ a b Brands, H.W. (2003), pp. 195-196. ^ Hill, Mary (1999), pp. 174-178. ^ Hill, Mary (1999), pp. 169-173. ^ Hill, Mary (1999), pp. 94-100. ^ Hill, Mary (1999), pp. 105-110. ^ 奇妙なことに、1906年のサンフランシスコ地震の前にカリフォルニア北部では歴史の記録にある他の時代よりも小地震の多い数十年間があった。1906年地震の前兆活動と以前広く解釈されたそれらの地震には、季節による強いパターンがあり、内陸の金採鉱の結果として断層の上に積み上がった沿岸湾への季節的堆積物の大きな負荷のせいだと分かった。Seasonal Seismicity of Northern California Before the Great 1906 Earthquake, (Journal) Pure and Applied Geophysics, ISSN 0033-4553 (Print) 1420-9136 (Online), volume 159, Numbers 1-3 / January, 2002, Pages 7-62. Bancroft, Hubert Howe (1884-1890) History of California, vols. 18-24. Brands, H.W. (2003). The age of gold: the California Gold Rush and the new American dream. New York: Anchor Books. ISBN 978-0385720885. Clay, Karen; Gavin Wright (April 2005). “Order Without Law? Property Rights During the California Gold Rush”. Explorations in Economic History 42 (2): 155-183. doi:10.1016/j.eeh.2004.05.003. Harper's New Monthly Magazine March 1855, volume 10, issue 58, p.543, complete text online. Starr, Kevin (1973). Americans and the California dream: 1850-1915. New York and Oxford: Oxford University Press. ISBN 0-19-504233-6. Burchell, Robert A. (Summer 1974). “The Loss of a Reputation; or, The Image of California in Britain before 1875”. California Historical Quarterly 53 (3): 115-130. ISSN 0097-6059. Burns, John F. and Richard J. Orsi (eds.) (2003). Taming the elephant: politics, government, and law in pioneer California. Berkeley and Los Angeles: University of California Press. ISBN 0-520-23413-8. http://www.questia.com/PM.qst?a=o&d=105960680 2007年2月14日閲覧。. Rohrbough, Malcolm J. (1998). Days of gold: the California Gold Rush and American nation. Berkeley and Los Angeles: University of California Press. ISBN 0-520-21659-8. Watson, Matthew A. (2005). “The Argonauts of '49: Class, Gender, and Partnership in Bret Harte's West.”. Western American Literature 40 (1): 33-53. ISSN 0043-3462.